Posted in: Observing. Tagged: astronomy, astrophotography. Among other fun things I did this week during spring break, I practiced using one of the Physics Dept.’s new telescopes. It’s a lovely little 127-mm Maksutov-Cassegrain with a robotic mount. I also used a NexImage 5 camera. 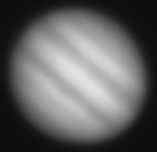 While the telescope is a joy to use, the camera is a pain, and I can’t convince it to return color images. In any case, I took advantage of the clear night on Friday and imaged Jupiter from the middle school baseball field across the street from my house. In spite of the fact that neither the seeing nor tracking were great, some post-processing with Registax returned a nice little image. Next steps: I need to do a better job with the tracking (probably need some new gear to improve the telescope alignment). A new camera might also be in order.